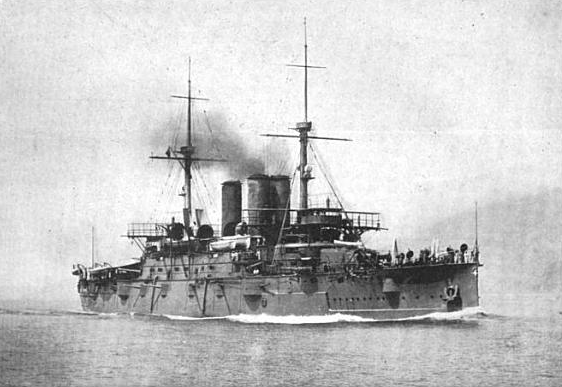 The two ships of the Margherita class, were the first large Italian modern battleships, designed in 1898 by Benedetto Brin, admiral, chief engineer and later minister of the navy. They had to be powerful and fast, but at the cost of sacrificing some protection. Main armament was massive, since outside the usual two twin 305 mm (12 in) turrets, the secondary battery comprised no less than 12 x 203 mm (8 in) guns. However Brin passed out before he can put an end to his ambitious design. Naval Engineer Ruggero A. Micheli took over the blueprints and seeked a more reasonable caliber. The concept however will be kept and applied later to Regina Elena class. These ships were 2 knots faster than the previous class, agile and good sea going vessels due to their high freeboard. The symmetry of their initial design was intended to deceive gunners and submariners on the real direction of the ship at low speed. In terms of propulsion, the gain in speed was obtined by a simplification of the all-coal burning boilers and dropping of the old mixed system. Started in 1898-99, launched in 1901 and completed in 1904-1905, these ships participated actively in the great war, the Margherita hitting two mines (UC14, December 11, 1916) off Valone, and the Brin sinking in Brindisi on September 27, 1915 because of an explosive charge laid by Austrian swimmers. The whole philosophy behind this class was driven from the previous painful experience of the “cheap” Ammiraglio di Saint Bon class. They proved at the same time too weak to engage foreign battleships and too slow to catch cruisers. The admiralty wanted a larger ship, of effective size in particular to answer to the new Habsburg-class battleships from Austria-Hungary. First, they wanted the 12-inch (305 mm) artillery back, but at the same time were ready to accept a loss in armor protection to achieve the required speed. In short, these ships were a crossover of a cruiser and proper battleships, glorified armoured cruisers or early battle cruisers. 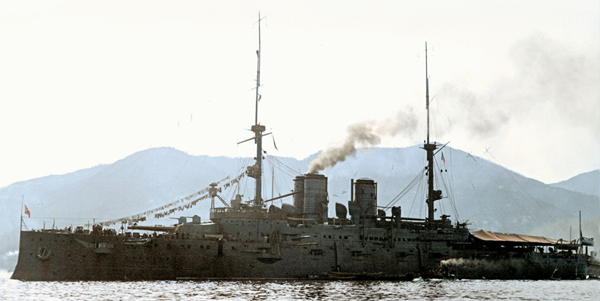 Benedetto Brin initial design was even more radical, with only two 12-inch guns but twelve 8 in (203 mm) guns. After he passed out, Admiral Ruggero Alfredo Micheli modified the design in a more conventional way, and probably for the best. In its final form these ships were 13,215 t (13,006 long tons; 14,567 short tons) empty and 14,093 to 14,737 t (13,870 to 14,504 long tons; 15,535 to 16,245 short tons) fully loaded and dimensiosn were 138.65 m (454 ft 11 in) in lenght, 23.84 m (78 ft 3 in) to the beam with a draft of 8.81 to 9 m (28 ft 11 in to 29 ft 6 in). They had an installed power of 21,790 ihp (16,249 kW) for 2 shafts, driven by two triple expansion steam engines, the steam coming from coal firing 28 boilers with three funnels, two in a forward pair and a single one at the rear. Top speed was therefore 20 knots (37 km/h; 23 mph) and range 10,000 nmi (18,520 km; 11,508 mi) at 10 kn (19 km/h; 12 mph) for a complement of 812–900. Main armament was two twin 305 mm (12 in)/40 guns, secondary armament comprised in the final form only four 203 mm (8 in)/45 guns in deck barbettes on the four corners of the superstructure, then twelve 152 mm (6 in)/40 guns, twenty 76 mm (3 in)/40 guns, two 47 mm (1.9 in)/40 guns, two 37 mm (1.5 in)/40 guns and four 450 mm (17.7 in) torpedo tubes. The choice of having lower caliber spared probably some structural and stability problems. Protection consisted in Harvey steel armour plating manufactured in Terni, 6in (152 mm) on the belt and side, 3.1 in (78.7 mm) on the dekc, 8 in (203 mm) turrets, and 6 in (152 mm) for the conning tower and casemates. This was light to say the least, whereas 20 knots was not precisely outstanding. Coal was used to contribute extensively in the protection, layed in the internal double hull as a cushion to prevent underwater damage. Propulsion 2 VTE engines, 28 boilers, 21,800 hp. 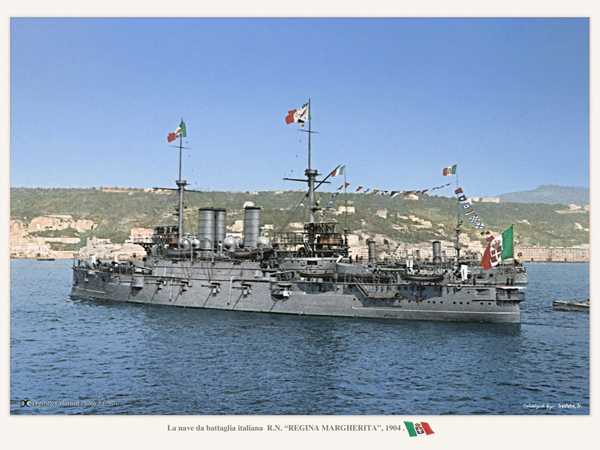 Regina Margherita was laid down at La Spezia on 20 November 1898, was launched on 30 May 1901 and completed in 1904, commissioned on 14 April 1904. The slow completion was due partly to material being not delivered and especially the heavy armor. The ship started her speed trials in the Gulf of Genoa during the summer and afterwards joined the Mediterranean Squadron. At that time budget constraints meant the ships were in active duty for seven months, training and in reserve with a skeleton crew the rest of the year. The Squadron comprised also the three brand new Regina Elena-class battleships and they participated in annual winter maneuvers in 1907, 1908 and 1909. Margherita served as flagship of Vice Admiral Alfonso di Brocchetti. A few years later, on 29 September 1911, war broke out with the Ottoman Empire. Libya. became the target of the Italian fleet, and Regina Mergherita joined the 1st Division, 2nd Squadron with both Ammiraglio di Saint Bon-class battleships in October. The two squadrons joined forced at Stampalia (Aegean) on 17 April, and raided the northern Aegean, cutting Turkish submarine cables and shelling the Dardanelles fortresses. Unfortunately, this move to drive the Turkish fleet in open see did not succeed. Both ships from then on went to cut other cables around Rhodes and Marmaris, the latter being shelled in the meantime and troops landed to seize the island of Scarpanto. The ships then retired to being re-barreled and in 1912, receiving four additional 3-inch guns. Italy was neutral in August 1914, but by July 1915 was at wa, facing the the Austro-Hungarian Navy. 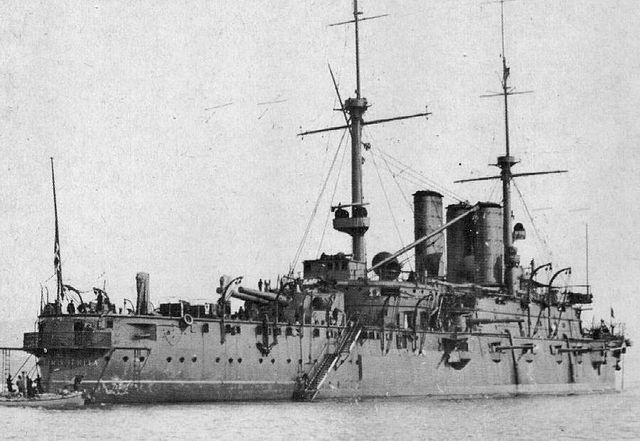 Admiral Paolo Thaon di Revel planned a blockade in the adriatic but with smal vessels, preserving the capital ships for a potential decisive battle with the Austro-Hungarian navy. Regina Margherita however was being reduced to a training ship with the 3rd Division. She met her fate however in the night of 11–12 December 1916 sailing in heavy seas off Valona and striking two mines laid by SM UC-14. She blew up and capsized, carrying with her 675 men but her loss was only announced in January 1917. 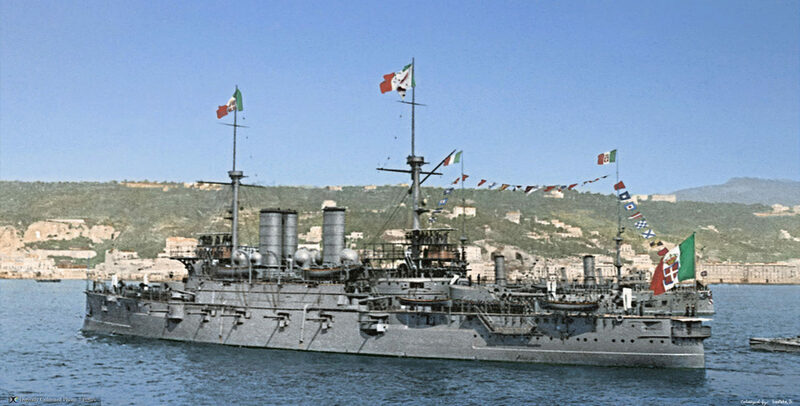 Named after the famous admiral and engineer, this ship was laid down at the Castellammare di Stabia shipyard on 30 January 1899, launched on 7 November 1901 but fitting out lasted for the next four years because of materials and armor shortage so she was completed only by 1 September 1905. She served right away with the Mediterranean Squadron, and on service for seven months alternated with reserve. After the the winter maneuvers and on 29 September 1911, was thrown in the conflict opposing Italy to the Ottoman Empire. Benedetto Brin served with the 1st Division, 2nd Squadron, squadron flagship of Vice Admiral Farvelli. By October, she relieve Roma blockading Tripoli, and later shelled its fortifications with her medium-caliber guns and was never threated by the weak counter-battery fire. On April 1912 she sailed from Tobruk to the Aegean Sea and met the 1st Squadron off Stampalia, joining the northern Aegean to cut Turkish submarine telegraph cables and shelled the Dardanelles fortresses. She went back to italy afterwards to replace worn-out gun barrels in Italy and received four exta four 3-inch guns. When Italy was at war during WW1, Brin was reduced to inaction and served as a training ship with the 3rd Division in Brindisi. However On 27 September 1915, she was destroyed ant anchor by a massive explosion. It was at first though the work of an Austro-Hungarian swimmer but the enquiry was re-opened recently and the Italian Navy experts concluded to an accident to me the mostl likely cause. 454 died in the explosion including Rear-Admiral Rubin de Cervin. Later 12-inch guns were salvaged and reused in fortresses protecting Venice.